The Fifteenth Day of the Eighth Month of the lunar calendar, a day that in 2017 falls on the 4th of October, marks the Mid-Autumn Festival 中秋節. A major public holiday in the People’s Republic since 2008, it is also known as 團圓節, the Festival of Reunions, a celebration of unity, togetherness, familial harmony and even conjugal felicity. In recent years the day is promoted as a ‘second Chinese Valentine’s’. Reunions were so rare and hard won in both China’s dynastic and modern eras that it is hardly surprising they are marked so frequently in the calendar. In 2017, Mid-Autumn Festival falls within days of the 1st of October National Day (and less than a week before the 10th of October celebration of the founding of the Republic of China on the other side of the Taiwan Strait). As a result, in the People’s Republic there is an eight-day public holiday from Sunday the 1st of October until the following Sunday, the 8th. For more on this, see 1 October 2017 — The Best China. ‘Mid Autumn’ in the hand of Yan Zhenqing 顏真卿 of the Tang dynasty. Source: Stele of the Many Pagodas 多寶塔碑 (the full name of which is: 大唐西京千福寺多寶佛塔感應碑文) from the 4th of October 2017, Palace Museum Calendar 故宮日曆. This is latest in our series of New Sinology Jottings 後漢學劄記. 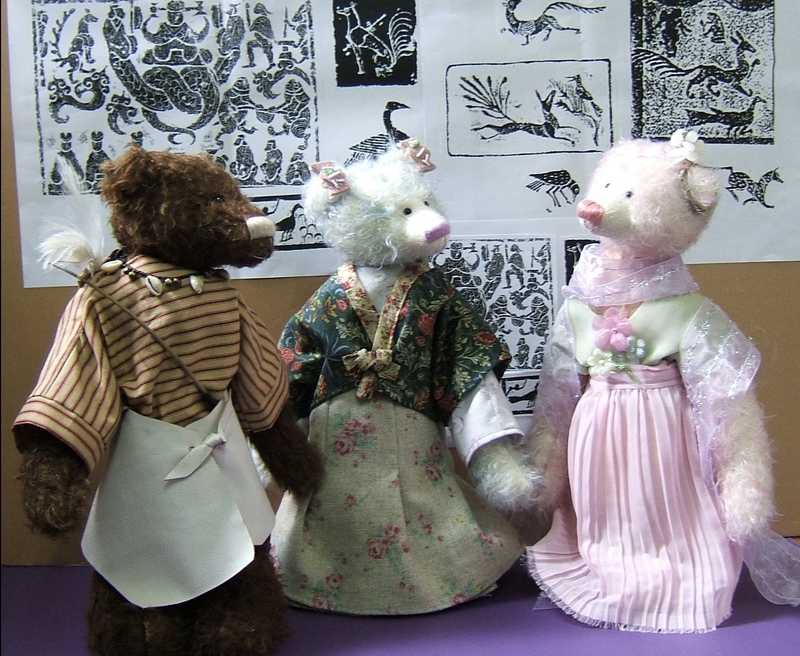 We mark this autumnal festival with a famous poem by Su Dongpo of the Song-dynasty, translated by John Minford, followed by another excerpt from the Hong Kong writer Xi Xi’s Teddy Bear Chronicles 縫熊志, translated by Christina Sanderson. Zhang Dai 張岱, essayist and memorialist of the late Ming-early Qing period in the seventeenth century, recorded revelries on the Full Moon night of the Eighth Month, here we offer one account from Suzhou. 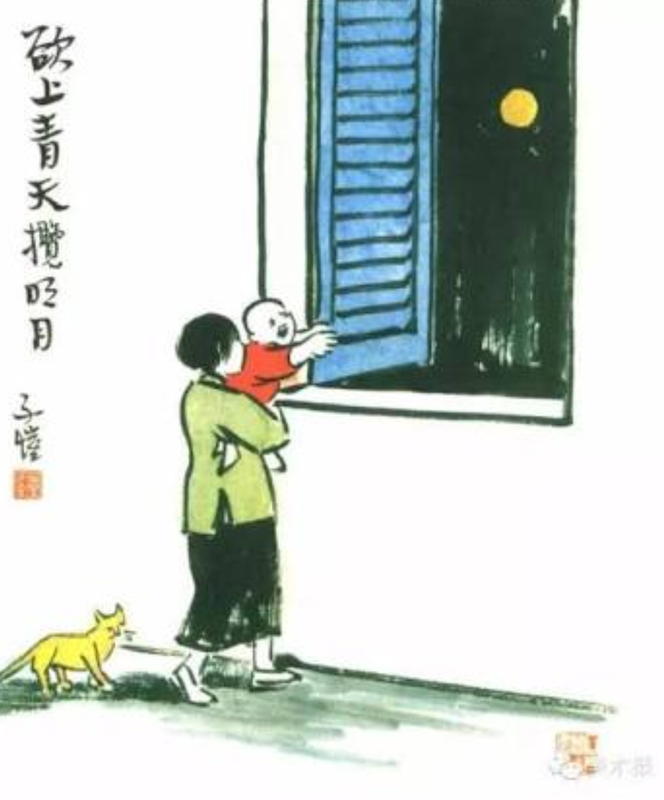 Mid Autumn, by TK (Tzu-k’ai, Feng Zikai 豐子愷). A number of chapters in the great Qing-era novel The Story of the Stone (石頭記, also known as The Dream of the Red Chamber 紅樓夢) also feature the Mid-Autumn Festival, and we have selected an episode from Chapter 1, translated by David Hawkes, to mark this day. This is followed by an account from Six Records of the Fleeting World 浮生六記, a chapter from the Manchu Bannerman Lincing’s memoirs and a famous poem by Mao Zedong in which he mourns a long-dead wife and the flight of Chang’e 嫦娥 to the moon followed by a comment on the political denouement of his last wife, Jiang Qing, and Shanghai hairy crabs. We conclude our reflections on the Harvest Festival by discussing a popular saying and an admonition from China’s party-pooper-in-chief, Xi Jinping: by all means celebrate, but not too much, not for too long and not too lavishly. Our thanks to Christina Sanderson and Annie Ren for their continued contributions to our New Sinology record of Chinese festivities, and to John Minford for his translation of a poem by Su Dongpo, as well as for permission to quote from David Hawkes’ translation of The Story of the Stone. When did such a bright moon ever shine? in the Bright Palace of Heaven? might be too intense to bear. I’ll play with my bright moonlit shadow. when we’re so far apart? in clear or cloudy skies. 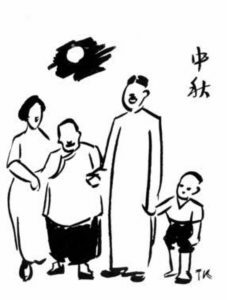 ‘Reunion’, by Feng Zikai of Yuanyuan Hall 緣緣堂. 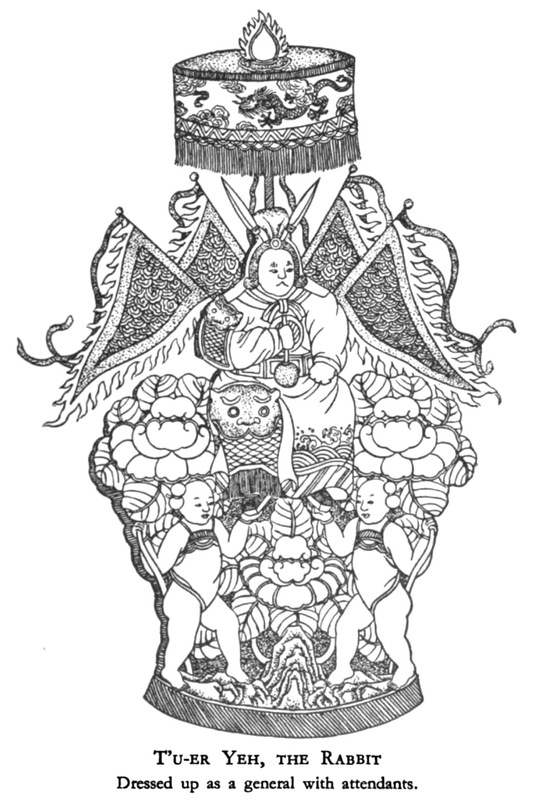 The Queen Mother of the West is a legendary figure in Chinese mythology. She lives in the Kunlun Mountains and was visited there by King Mu of the Zhou Kingdom. Famous peaches of longevity grow in her garden. It’s said they ripen only once in 3000 years and can bestow immortality on those who eat them. Later tradition speaks of her having a husband: Royal Lord of the East. Yi the Archer, Queen Mother of the West and the Moon Goddess Chang’e by Xi Xi. Pekinese call the festival of the eighth month the Zhongqiu 中秋, and every year at this time noble families make presents to one another of moon cakes 月餅. and various fruits. This, the fifteenth day, is the time when the moon is full, and so melons and fruits are laid out in the courtyards as offerings to her. Sacrifices are also made with yellow beans (intended for the rabbit in the moon), and cockscomb flowers (the flower of the month). At this time the white disk of the moon hangs in the void, and when the tinted clouds first begin to scatter, windups are arranged with bowls washed amidst the noisy hubbub of children. Verily it is what one may call a beautiful festival. However, at this time of making offerings to the moon, men usually do not make an obeisances, so that there is a Peking proverb which says: ‘Men do not bow to the moon. Women do not sacrifice to the God of the Kitchen’ 男不拜月，女不祭竈. (Note: This is because the moon is supposed to belong to the yin or female principle, just as the sun is male or yang. Therefore it would be inappropriate for a man to worship the moon, whereas as the head of the household he would naturally sacrifice to the God of the Kitchen. For the Zhongqiu moon cakes, the Studio of Perfect Beauty 致美齋 at Qianmen, is the best place in the capital, whereas those of other places are not worth eating. But as for moon cakes to be used solely as moon offerings, every shop has them. 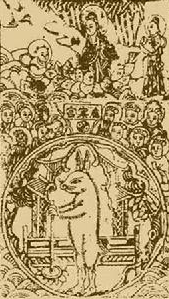 The big ones are more than a foot in diameter, and have portrayed on their tops the images of the three-legged toad and the rabbit of the moon. (Note: This toad 蟾蜍 or 癞蛤蟆, like the jade rabbit 玉兔, is also an inhabitant of the moon, and some legends say that he is really the Goddess of the Moon, who was transformed into a toad.) Some people eat these cakes as soon as the sacrifices to the moon are completed, whereas other people keep them until New Year’s Even before eating them. They are called full moon cakes 團圓餅. Peip’ing: Henri Vetch, 1936, pp.64-67. Mid Autumn Festival in Suzhou. The Elite Theatre of the Ming. 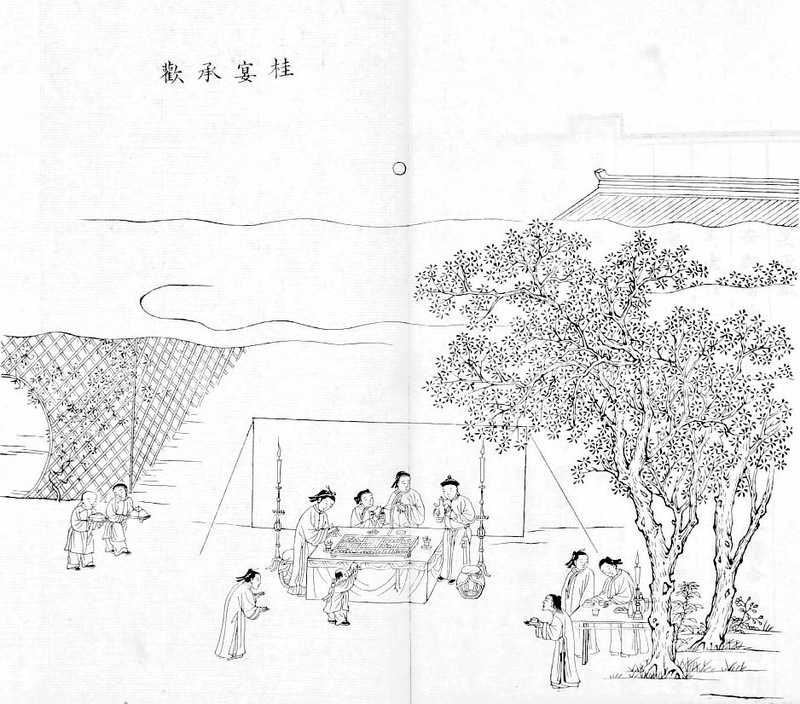 A Mid-Autumn family gathering in The Story of the Stone. Source: Sun Wen 孫溫, Illustrations for the Complete Dream of the Red Chamber 《繪全本紅樓夢》. On earth ten thousand heads look up and gaze. Zhen Shi-yin celebrates the full autumn moon with his friend Jia Yu-cun, a younger scholar in an episode from Chapter 1 of The Story of the Stone. Sorrow comes often this poor heart to fret. Was there not one who, parting, turned to stare? Hope, underneath the moon, a friend to find? Shine first upon the chamber where she lies. The jewel in the casket bides till one shall come to buy. The jade pin in the drawer hides, waiting its time to fly. Whose cold light bathes each marble balustrade. The following episode is from Shen Fu’s Six Records of the Fleeting World 浮生六記 said to have been completed in 1808. 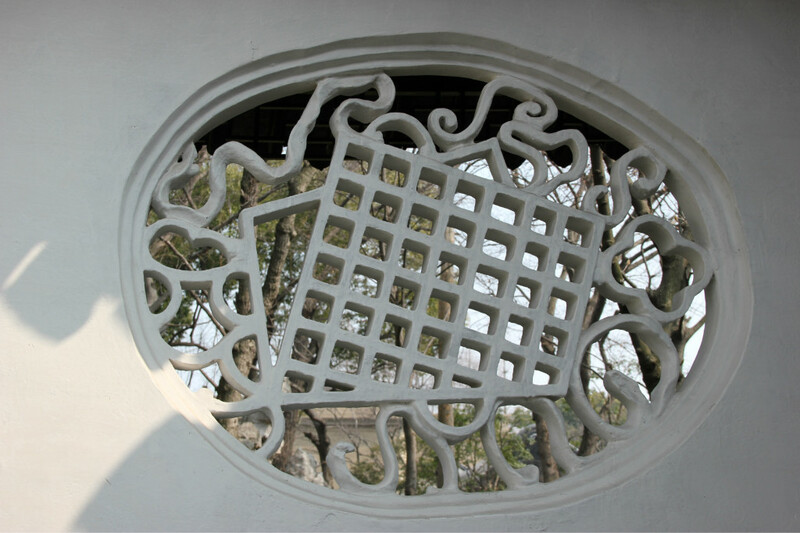 A carved window 漏窗 at the Pavilion of Surging Waves 滄浪亭, Suzhou. trans. Lin Yutang 林語堂, with minor stylistic modification. 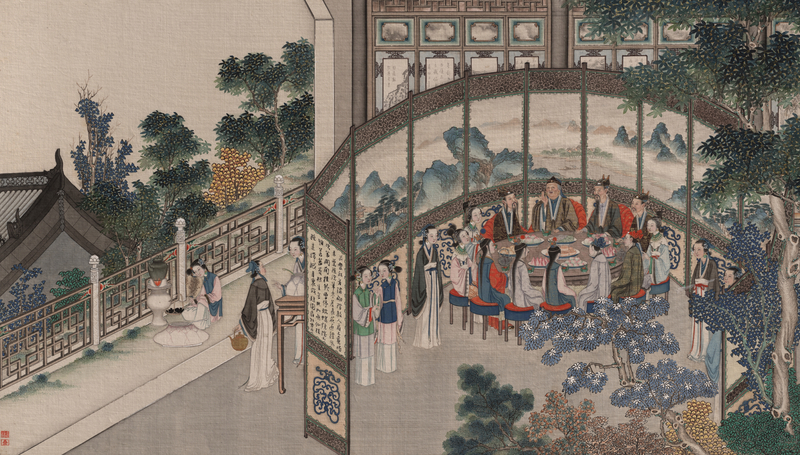 Titled ‘Cassia Banquet to Make Mother Happy’ 桂宴承歡 this episode is taken from the Manchu Bannerman Lincing’s (Linqing 麟慶, 1791-1846) Tracks in the Snow 鴻雪因緣圖記, the translation and annotation of which was initiated by John Minford. 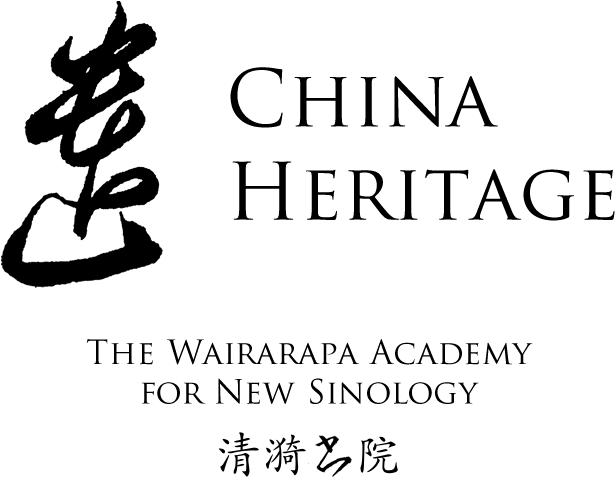 It is one of the Projects of The Wairarapa Academy for New Sinology. The cassia tree, and a woodcutter, forever chopping down the tree, are legendary features of the moon. As soon as the tree is felled, it regrows as its essence is said to be life-giving. In front of the Tower of Purple Verdure 紫翠樓 in the compound of the Xin’an 新安 Prefectural Office and Residence stood two cassia 桂 trees. The circumference of one of these trunks was so large it required both arms of a person to enclose it. There was also an ancient one from the days of the Six Dynasties, of which only half the trunk remained. The outer bark was cracked but the remaining trunk was substantial. In the autumn there were not many blossoms, yet their fragrance was exuberant and surpassed that of ordinary cassia flowers. In the eighth month of the year jiashen 甲申 , I received a new appointment that transferred me to the Prefecture of Yingzhou 穎州. I handed over the seal of Huizhou Prefecture. When the work of the Veritable Record of the Emperor Renzong 仁宗 Rui睿 was accomplished, all those still working in the Office were graciously rewarded whereas the officers who had left the Office already were just ‘honourably recorded’ in their Curriculum Vitae. The honorary rank of Circuit Intendant 道銜 was bestowed by edict to myself Lincing alone. 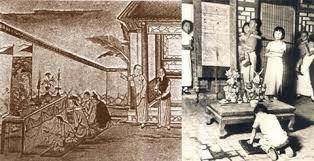 Two lengths of silk were also bestowed, as well as five thin plates 鉼 of silver, which were sent down to Huizhou. On receiving these I kowtowed in the direction of the Imperial Palace and also petitioned the Governor of Anhui to beg him to present a memorial of thanksgiving and gratitude to the Sovereign on my behalf. I presented the silk and the silver to my mother. She ordered that the silver be entrusted to the silver-smith to make spoons or other articles to be used at sacrificial rituals in our family Ancestral Temple to glorify and commemorate the Sovereign’s bestowals. She ordered that the two pieces of silk be made into a coverlet to be placed on the body of the deceased in the coffin — in substitution of a dhāraṇī quilt embroidered with lines from the Buddhist sutras — to express our gratitude to the Sovereign’s favour. The cassia banquet, from Lincing, Tracks in the Snow. During the interval between my posts, I was unoccupied and enjoying my leisure. I therefore provided feasts and engaged players to give dramatic performances to thank my friends who had been coming to congratulate me. In the evening of the Mid-Autumn Festival — the fifteenth day of the eighth month — I provided a family feast under the two cassia trees. The moon was as radiant as water, and the flowers were more dazzling than gold. With red candles glowing, and splendid sumptuous dishes repeatedly served, I, Lincing, raised my goblet to pledge and wish my mother longevity. My wife offered chop-sticks and my daughter Miaolianbao 妙蓮保 broke open a pomegranate to offer to her grandmother while affectionately sitting at her grandmother’s knees. Presently, somebody delivered some Immortal Yellow Peaches from Huangshan 黃山仙桃, which my eldest son Chongshi 崇實 (who was then five years old, having been born in the seventh month of the year gengyin 庚寅 ) took and offered to my mother, who looked upon him with delight. Mother was so glad and told us to enjoy ourselves and to drink to our hearts’ content. Steeped in imperial favour 國恩 and family happiness 家慶, the felicity of the party guests and the brightness of the moon were both in perfect plenitude. Even the enviable felicities of the celestial immortals — I supposed — could be no greater than the blessings which we enjoyed that night. The following poem, made famous as a performance piece during the Cultural Revolution, and subsequently sung, filmed and dramatised ever since, is noteworthy as a rare expression of humanity and sentiment by the steely revolutionary. The Willow 楊 referred to is Mao’s second wife, Yang Kaihui 楊開慧, executed in 1929 after having refused to denounce her husband, and father of her three children. Mao Anying, one of the children, was said to have been forced to witness her death. Anying subsequently died during the Korean War. Serves them a laurel brew. To dance for these loyal souls in infinite space. ‘Reply to Li Shuyi’ in the hand of Mao Zedong. 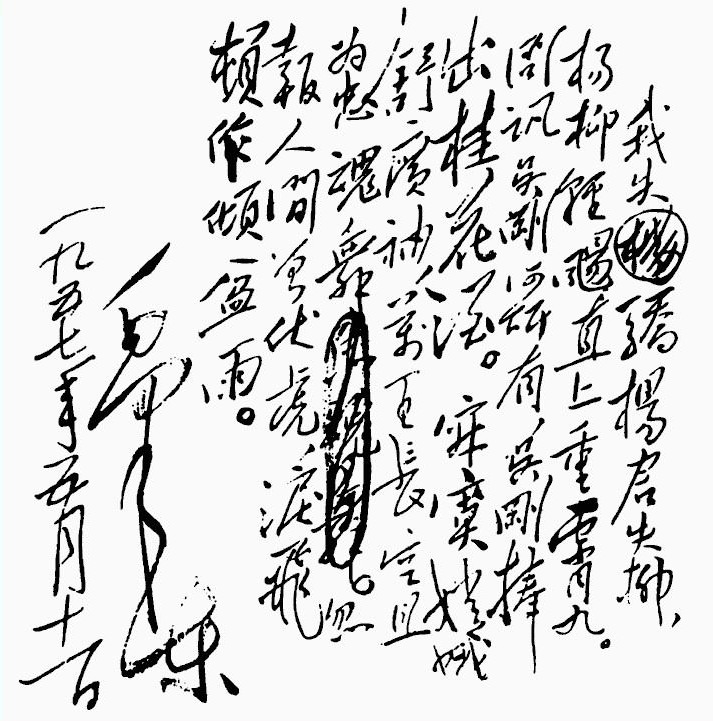 This poem, also by Mao, was written during the Mid-Autumn Festival of 1947. Under pressure from the Nationalist Army following the outbreak of Civil War the previous year, Mao and his Communist forces abandoned the guerrilla base at Yan’an. Trekking through northwest China at the time of the Reunion Festival and cut off from family (Jiang Qing and their daughters, see below), Mao marks the festival by composing these lines in celebration of a military victory. Following years of warfare, from the time of the Northern Expedition of the late 1920s to the end of the Civil War on mainland China in 1949 (also known as ‘Liberation’ 解放), hard-won national unity and stable government promised a new era. Under Mao Zedong’s leadership, and with the support of his Communist Party colleagues, from the early 1950s what unfolded instead was three decades of domestic tragedy: families decimated, young pitted against old, broken friendships, lovers betrayed and country darkened by a pervasive atmosphere of suspicion and fear. Following Mao’s death in September 1976, people celebrated a ‘Second Liberation’ 第二次解放. With a ‘third age’ unfolding in China today some place their hopes in a fourth Liberation at some uncertain point in the future. Celebrating the fall of the Gang of Four with the fruits of the season: crabs, Shaoxing wine, chrysanthemums. Painting by Huang Zhou 黃冑. In the Lower Yangtze Valley, one of the gustatory delights of autumn is the eating of mitten crabs (also called ‘Shanghai hairy crabs’ 上海大閘蟹). Those from Yangcheng Lake 陽澄湖 near Suzhou are regarded as being a particular delicacy. In October 1976, a mere month after Mao Zedong died in Beijing, a military coup led by Marshall Ye Jianying of the People’s Liberation Army and supported by Hua Guofeng, Mao’s final hand-picked successor, led to the arrest of key Cultural Revolution political figures known variously as the Gang of Four and the Shanghai Clique. These leaders — Wang Hongwen, Zhang Chunqiao, Jiang Qing (Mao’s widow) and Yao Wenyuan — were popularly despised by the party-state bureaucracy for their erratic and domineering behaviour, often described using the expression 横行霸道, to ‘run amok’ (literally, ‘walk sideways and be a hegemon controlling the roadway’). As crabs walk sideways, and the expression ‘run amok’ contains the term ‘walk sideways’ 横行, to celebrate their fall from power after ten years of chaotic misrule, people bought crabs in sets of four, three male and one female 三公一母, to eat while drinking sweet wine and cheering the end the Maoist era. Soong Ching-ling 宋慶齡, widow of the founder of the 1912 Republic of China Sun Yat-sen, and the most famous fellow-traveller of the Communist Party (an organization she applied to join shortly before her death in 1981), is also said to have celebrated the ouster of the Gang of Four with a meal of four Shanghai hairy crabs. ‘Even the moon in foreign skies is rounder than that of China’ 外國的月亮比中國的圓 — this was a saying attributed to various disgruntled Republican-period (1912-1949) writers and thinkers. It reflected an ever-present sense of national inferiority, and the underlying humiliation, that had grown since the encounter of late-dynastic China with the mercantile Western Powers. Throughout much of the twentieth century, the roundest moon of all was thought to shine over the United States. During the Maoist era (1949-1978), the saying ‘Even the moon in foreign skies is rounder than that of China’ was used to deride intellectuals and others deemed who were deemed to be ‘slaves of the West’. It was quoted with malicious intent by those party leaders, hacks and hitmen (and women) determined to stamp out support for foreign ideas and values. As China’s People’s Republic strived to emulate all that was materially progressive about the West and Japan in the Reform era (1979-1992), the criticism of this expression, although ever-present, was more muted. In the post-1992 surge of neoliberal party-state economism, this saying has been employed more frequently; under Xi Jinping (2012-) it has taken on a menacing new tone. Today, the moon over America, and other liberal democracies in the West, waxes and wanes erratically. Officially, China’s leaders express confidence that, even though pollution and smog-haze becloud the skies of the People’s Republic and frequently occlude Chang’e’s Lunar Palace, the moon over China will continue to wax. Another, older, popular saying is: ‘The Toad Thinks it is Worthy of Eating the Flesh of a Swan’ 癩蝦蟆想吃天鵝肉. It means that unworthy people are self-deluded; the most ungainly think it their lot to enjoy rare delicacies. Since the Lunar Toad 蟾蜍, or 癞蛤蟆, is also believed to be none other than Chang’e, Goddess of the Moon, this would seem like a fitting conclusion to our Mid-Autumn New Sinology Jotting. On the eve of the Nineteenth Congress of the Chinese Communist Party scheduled to be held in Beijing from mid October 2017 perhaps this saying also addresses the overweening aspirations of China’s Chairman of Everything. 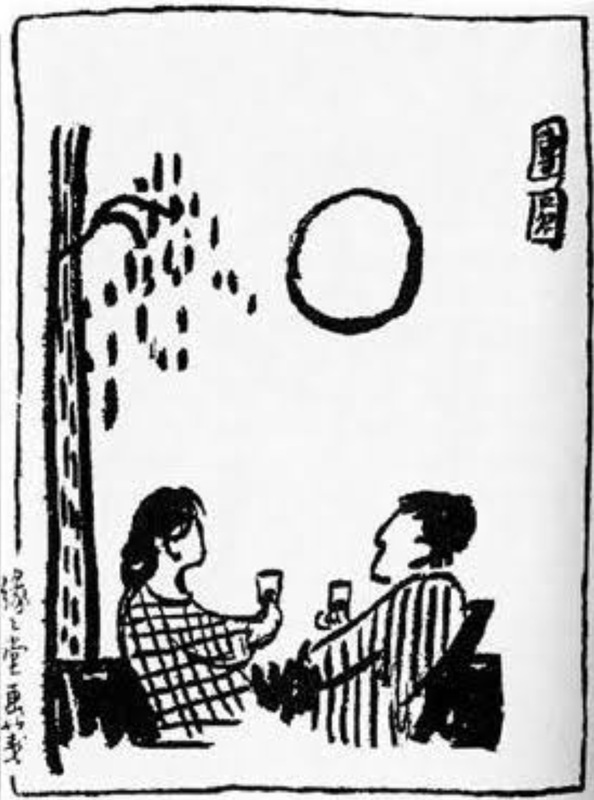 ‘Would that I can ascend the very heavens to grasp that glowing orb’, by (Feng) Zikai.